The explosion of e-commerce sites has created a dilemma of how to address fit in a virtual environment. The focus of next week's convention of the International Association of Clothing Designers and Executives will be on this subject and I am sure I will have lots to report when I get back. One thing I will bring to readers now is that the methods of measuring garments used by sites like e-bay are driven by sportswear so the terminology used and the actual methods are different than those commonly used in the tailored clothing industry, so if you are only familiar with e-bay or Styleforum conventions, you may end up confused when talking to a tailor or a manufacturer. 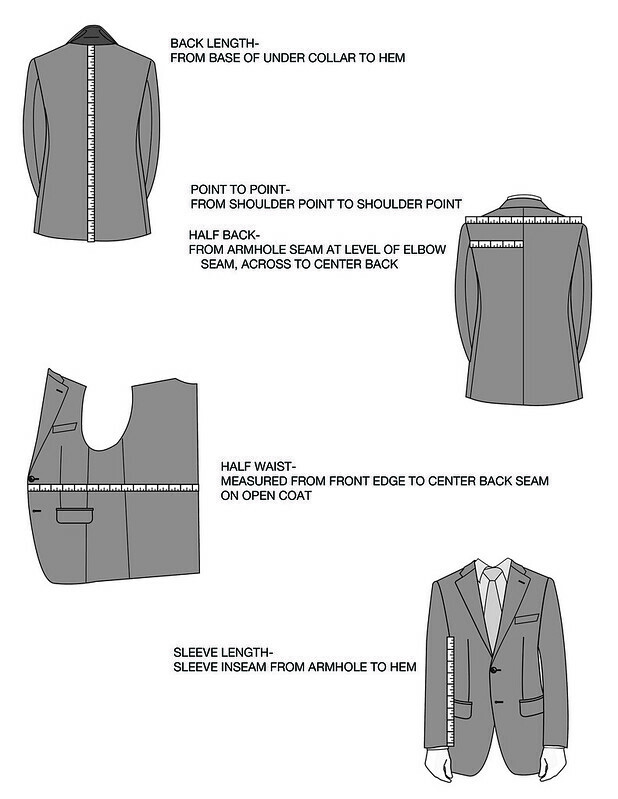 Below is a guide to the terms and methods typically used by tailored clothing manufacturers- some may vary slightly, like the exact level of the knee, but these are pretty much standards. Many thanks for this information. Now if only eBay sellers would use a consistent measuring method so that when I ask for the numbers, I'll know just where and how they took the measurements! 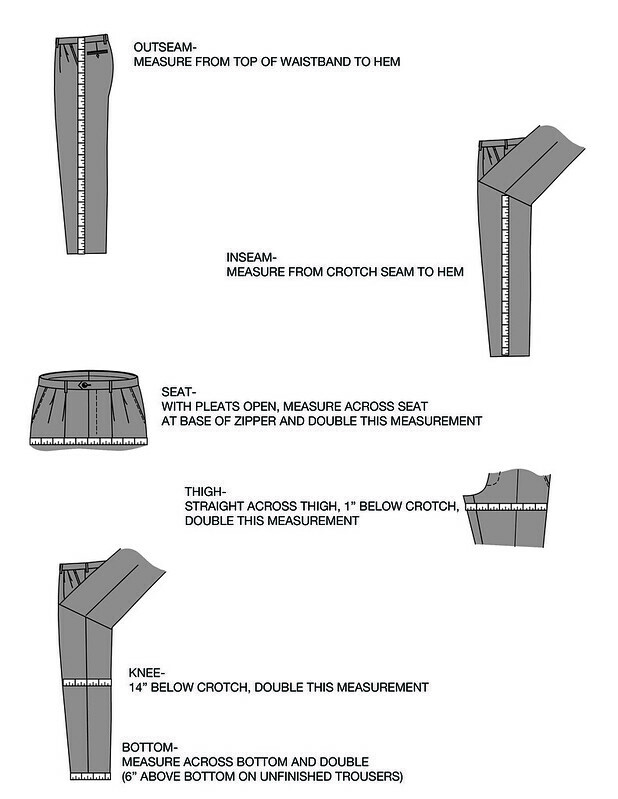 1. how do you measure half waist on a coat, I would have difficulty to actually make it flat. 2. it's interesting that you guys measure seat and not waist, any reason why? I did have a bespoke pant that sit very well even though I lost 1.5 inch in waist through the process. 3. I am not clear on half back, can I just take at the middle of the arm hole. If you are fishing for stuff on fleabay, then I would think that the way the trade measures sleeve length is less useful because it assumes that the scye measurement is either known or constant? If I take a bespoke coat and an off the peg coat, the difference can exceed an inch. Very few people know the importance of inseam in case of trouser length. This is the only measurement by which correct length of trousers could be made. A great illustration. then, why is not fundamental a measure from shoulder point to hem? is perhaps the armhole a standard? I'm confused. To be clear, I never suggested this was the best way of measuring garments; clearly there are shortcomings in any system and we, as an industry, are actively working to improve this. I merely offer this as a guide to terminology and usage that is actually in usage in the manufacturing industry. Online companies, particularly recent startups, may have their own systems. Really very interesting and very valuable information about the fashion,beauty and makeup keep it up more. All your information about the fashion and clothing are very well and interesting.